As I prepare for Orlando, I am reflecting on what did we miss on the signs of Christmas. The Poisenetia, the tree, the Christmas lights, coming home for Christmas, and the candy cane So there are a few things left. Let us start with the deer. 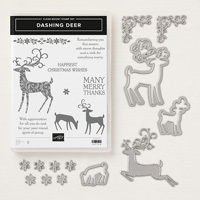 The Dashing Deer stamp set with the Detailed Deer Thinlits Dies will add to the holiday scene. Using the dies makes it so easy to create a beautiful card. Add the Tin Tile Embossing Folder and you bring the card alive with the texture. If you are short on inspiration take this idea to heart and create it. I heard from so many people at the craft shows that creating is their weakness. That is what I am here for. To guide to creating your own or copy mine. So don’t let lack of creativity to stop you from enjoying stamping. You can also pull ideas from the Stampin’ Up! catalogs or google search that stamp set. Don’t forget the newsletter goes out on Tuesday and Wednesday is the Twelve Weeks of Christmas. Make sure you are signed up to enjoy all fun! Plus I will have a special announcement in the newsletter.